Gunnebo Johnson open wedge sockets combine positive attachment with optimum versatility. Easy-to-change Gunnebo Johnson wedge sockets consist of a C-1040 normalized and tempered cast steel body, a C-1040 cold-finished bar stock pin with cotters and a ductile iron wedge to specific wire rope size. 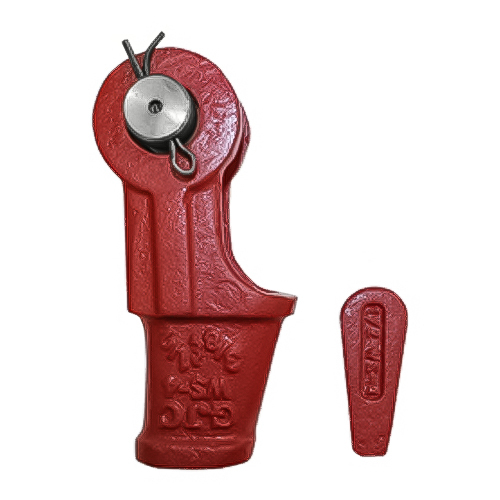 Together, the wedge and body act as a vise which grips the wire rope and locks it in place. Gunnebo Johnson wedge sockets may be used with multiple sizes of wire rope. To switch from an overhaul ball application calling for a 7/8" wire rope to a block application calling for a 1" rope, it is not necessary to buy a completely new wedge socket. A simple change-out of wedges will suffice. Of the 18 models of wedge sockets offered by Gunnebo Johnson, all can be adapted to at least two sizes of wire rope. In fact, the WS-4 and WS-5 will adapt to three sizes. Be sure that the wedge is correct for the wire rope size. Each socket manufactured by Gunnebo Johnson has a model number and acceptable rope sizes cast into its body. Each wedge has the rope size and particular socket model it will fit. Wedges are also coded by means of color. Red indicates that the wedge is for the largest size of wire rope stated on its socket. Green indicates that the wedge is for the smallest size of rope stated on its socket. Blue indicates that the wedge is a rope size of 9/16"; black for 7/16". When using wedge sockets note that two precautions should be taken. 1) Make sure that a sudden jolt or impact does not dislodge the wedge. When installing wire rope, always pre-load the wedge with wire rope in place. Check frequently to re-tighten or re-position as necessary. 2) Make allowance for the crimping effect common with all types of wedge sockets. Experience shows that it will reduce the Working Load Limit (WLL) of a line by approximately 20%.